Mention “Shelter Haven” to the average, long-time Stone Harbor resident or visitor and they may tell you about fond memories from idyllic childhood family vacations – stories about catching their first sea bass and taking a dip off the docks right outside the dining room of the three-story Shelter Haven Motel of the 1960s. Some might even fondly recall the Shelter Haven Motel as a place they spent most of their summers dancing the night away at the iconic bay side nightclub, Touché. Further back, perhaps beyond their own memories, in some yellowed scrap books are stories of “the Brightest Spot in Stone Harbor” describing The Shelter Haven Hotel’s grand opening in September of 1912, the very same year as the Titanic tragedy. Spearheading the tourism growth and development of downtown 96th street, this hotel was instantly a welcomed addition where they celebrated their launch with a fully occupied hotel and an inaugural banquet held in their high-ceiling and expansive dining room. The hotel had 60 luxuriously appointed rooms with plush carpeting and elegant, but home-style, furniture. The basement of The Shelter Haven Hotel was home to its Grand Floor, which housed a buffet, pool rooms, and Stone Harbor’s first fully equipped barber shop. The property also had a yacht landing wharf on Shelter Haven basin, and its café was located right over the water. Eventually yacht-owners would have “yachting parties” that traveled throughout Wildwood, Cape May, and Ocean City. Stops on the Pennsylvania and Reading Railroad lines were right within a block of the Shelter Haven Hotel and this was the vacation place to be. 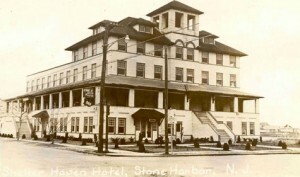 The original Shelter Haven Hotel represents the history and heart of Stone Harbor’s past. Looking ahead, The Reeds at Shelter Haven pays homage to Shelter Haven’s rich hospitality history by opening its doors to a new era more than 100 years after its predecessor and laying its own historical foundation by building new memories and traditions for families visiting this charming seaside town.